Read Proverbs 3:5-6. 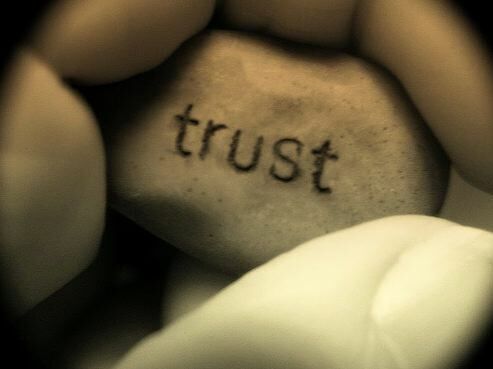 Focus on the word "trust." Then, try to locate a verse in the Bible that instructs us to "trust" something/someone other than the Lord. *Share your results on Comments. This morning, I read a devotion by Oswald Chambers that reminded me worry (opposite of trust) is unbelief. So is what he calls "careful commonsense" because both are in opposition to abandonment. And being abandoned to God means we fully trust Him. Great Post today. Love it. I read this completely wrong. I thought I would find that verse/example but I didn't. I know, it sounds naive. Not sure what I thought I would find but I don't claim to be a bible scholar. Sounds silly now that I am wide awake and reading the post a little more clearly. It was a good reminder to trust (only) in the Lord and not ourselves, our neighbors, or our riches. Sorry for the double post. I just spent some time rewriting Psalms 40:1-4 and meditating on it and how it applies to my life. Wow, what powerful verses! Great reminder that God is in control and we should just keep trusting in Him. When things are tough, its easy to start looking for answers in the wrong places and forget that God has already provided the answer. Thank you.